This page is dedicated to coupes that you, the readers of this web site have. So please send me a photo of your coupe and some relevant information and I will put it up in this section. This is Dave Boboc's John Goss. This coupe is in the States. This is Grant Opie's Landau. 351C, 4V Heads 8.9:1 compression, 290BHP @ 5000rpm. 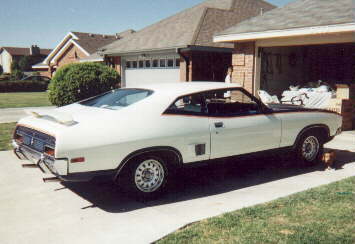 This is David Jaffray-Smith's XA Coupe. 429 V8, Twin 600 Hollies, C6, 245's up front and 265 rubber at the drive end. 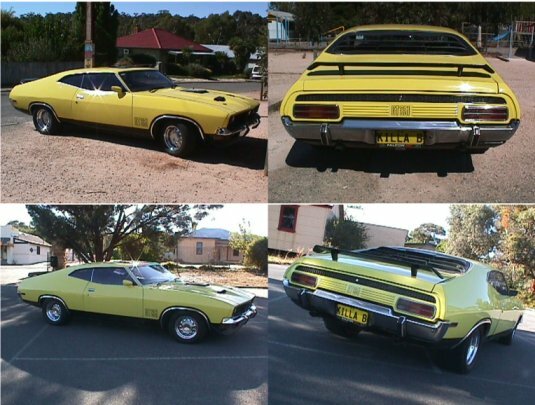 1) Old guy bought it brand new in 72. 14x8 Cragers, 245-265 Eagers, Alpine CD shuttle and head unit with 6x9's. GT dash with speedo in Km's. pulled off the front and rear bumpers, also the stone gaurds and front grille for a tidy/clean up. started to clean underneath (only 2.5kgs of dirt so far !). "The drive shaft, diff and rear axels are standard which is a bit of a worry. Not sure of the actual mileage of the car as the new speedo is not reading correct. ie. reads 100 km's but traveling 70 km's. the 2nd owner estimates 115,00mls as the car spent most of the time in his garage while he changed motors and suspention. The good thing is he kept all the original stuff. 302, C4 and all the suspention which I also own. I've had to buy another bonnet to cut a hole in it to allow for the tunnel ram/hollies. (the original bonnet is too good to cut). I'll have to put a scoop on it to get certification. I plan to do a small tidy up as cheaply as possible to start with. Then see how she goes down the 1/4 mile. Drive it for a year or two then give it the once over. Nothing too drastic (famous last words). Probably de-wire the engine bay, new carpet, a bit of upholstery work (the interior is in excellent nick) and remove the little rust that it has. 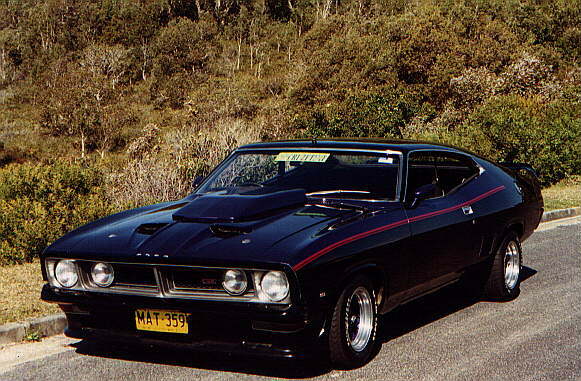 And maybe, just maybe, A GT paint job. Still not sure. Anyway that's the story so far....Not bad for only my 2nd V8." 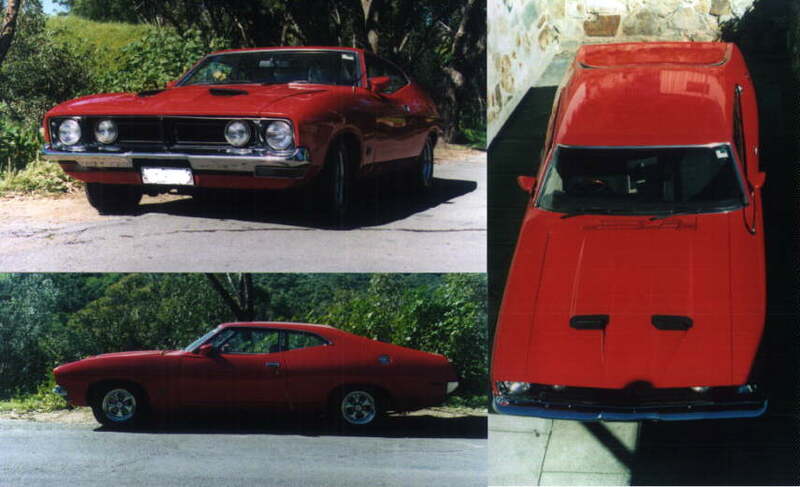 This is Michael Lagoutatzis' completely original Landau. The only extra is an 8 track stereo, everything else is standard. Original colour (polar white) with saddle trim interior. This is Darren's XA GT Coupe. Motor:351 850 Holley 2v heads Sig Erson cam (Viking 100 H) Genie extractors, twin 2 1/2 turbo mufflers with dump pipes. Diff:9 inch LSD 3:55:1 gears. "I have owned the coupe for over 5 years now, drive it most weekends and will own it forever...."
Introducing David Kemp's XB Coupe. Motor:351 bored 20 thou (Sawkas Performance), mild Cam Dynamics cam, 600cfm Holley with vacuum secondaries. Trans:C4 auto rebuilt by SA Race Transmissions, modified stage 2 shift kit, B&M Starshifter. Other:Wheels are 295 BF Goodridges on XE S pack rims modified to 15X10 inch on the rear, and the front are also XE rims at 14X7. The interior was originally brown and tan, but has been redone in black. It has a GT dash which has Autometer Tacho, Vacuum and Oil Pressure gauges. Pioneer DEH 8500 head unit replacing the standard radio. The speakers are Pioneer 6 inch in the front and 6X9 inch on the parcel shelf. There are also two 10 inch subwoofers on the parcel shelf powered by an Impulse Kicker amp. The boot has been squared off with MDF and covered! in black marine carpet. The body now has front and rear spoilers, modified bonnet scoops, and GT markings with a "shaker" poking through the bonnet. This is Mat's XB GT coupe. Not much information on this one yet, although I know there is a supercharger under that passive looking bonnet scoop. This is Toby's genuine Cobra. Cobra # 344: 302 V8, Auto Transmission. Toby is actually the guy that delivers pizza to me, imagine my surprise when my pizza delivery man turns up in a Cobra! 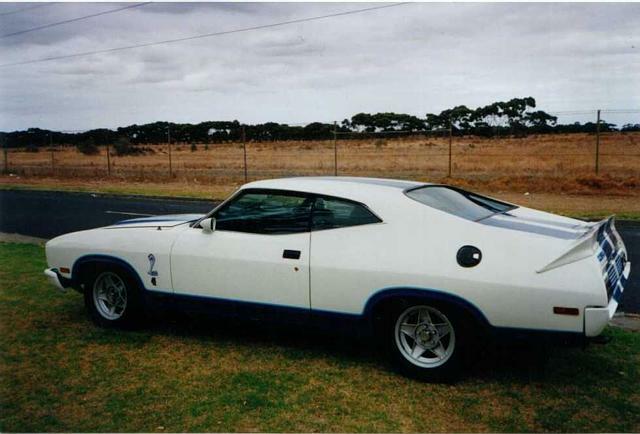 This is Michael's XB coupe. Motor: 351 Cleveland, 600cfm Holley vacuum secondaries, extractors, mild cam. Wheels/Suspension: 14x8 & 14x7 Cragers with 245 wide rubber, Lowered 2 inches all round, rear sway bar. Other: 325,000 original kms, Twin headlight grill added. Black & Tan interior, wood grain steering wheel, CD player, sports instruments, FORD floor mats.